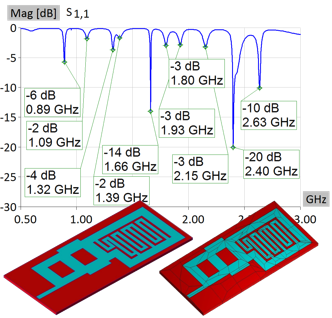 This application note presents a design of a printed inverted-F antenna (IFA) used in a radio-frequency identification (RFID) reader verified through the measurements. The IFA was built and simulated using WIPL-D Pro CAD environment – the highly advanced method-of-moments (MoM) based EM simulation tool that allows simulation of complex EM devices in seconds or minutes on inexpensive regular desktop or laptop configurations. Various real-life EM effects if IFA environment, such is influence of neighboring metallic objects, were taken into the account. The simulation of the designed IFA used in RFID reader is carried out on a regular desktop PC in approximately one minute per frequency point. 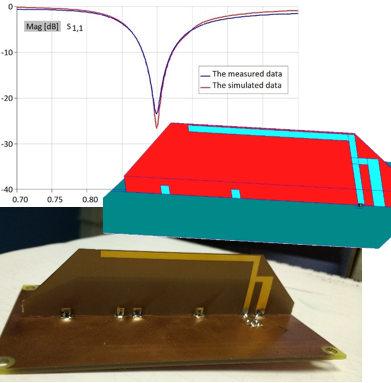 The simulation time is higher than the expected owing to presence of very thin flexible substrate (100um) used to fabricate the antenna and the complex details of a realistic environment surrounding the antenna. The inverted-F antenna was prototyped to verify compliance with the customer specification through the measurements. The measurement of the fabricated IFA was carried out at the School of Electrical Engineering, University of Belgrade. The measurement is in an excellent agreement with the simulated data. The good agreement and successful fulfilment of all design requirements have resulted in the antenna becoming a part of a commercial RFID product. 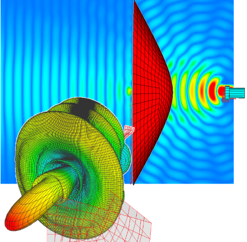 Besides the core business of the WIPL-D company which is the development of the state-of-the-art full wave EM simulation tools, the consulting services are also the important asset of the company. This is the result of high competence and expert knowledge gained over the years and accumulated throughout customer support, continued education, collaboration with the universities, literature surveys, involvement in many consulting services and collaborative projects etc. The lenses are antennas designed to collimate incident energy and to prevent it from spreading in undesired directions (the beam focusing). 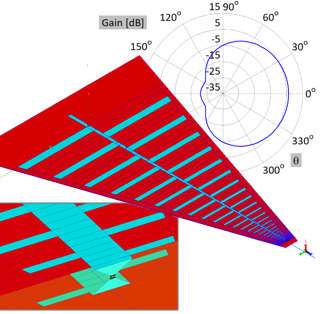 In this application note, we show Luneburg lens illuminated by corrugated horn antenna. The lens is represented as spherically symmetric structure with variable index of refraction. Basically, Luneburg lens is modelled in WIPL-D Pro as 5 spheres with coinciding centers. 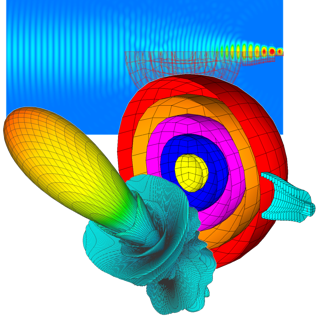 The simulation results include 2D and 3D radiation pattern, as well as focused near field. Comparing free space radiation with the radiation of the overall lens shows energy collimation and gain increase. Simulations are carried out at inexpensive desktop PC, while the simulation can be further speeded up by using the GPU solver. 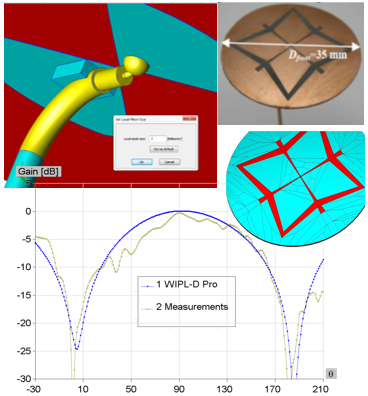 The aim of this application note is to demonstrate the possibilities of WIPL-D Pro 3D EM Solver regarding design and simulation of complex printed antennas in a wide-band. The tool used is WIPL D Pro CAD, allowing Boolean operations, solid modelling, automated quadrilateral mesh etc. Features such as total imaging and edging are done in seconds. The model is made according to specifications from the Microwave Journal published in May 2008. Duration of the complete process of fully-parametric model creation and simulation in WIPL-D Pro is approximately one hour. The simulation takes several seconds per frequency point at standard desktop PC, with extremely small number of unknowns. The frequency band from 0.5 to 3 GHz with 10 resonances present requires only 65 frequency points, due to powerful built-in interpolation. The application note shows the complete simulation process for an antenna designed externally from the WIPL-D suite and provided as CAD geometry (STEP) file. It includes import, healing, adjusting materials, mesh and simulation. Importing the file (in a single click) results as project consisting of several parts defined as metallic. During and after import, WIPL-D Pro CAD offers variety of advanced tools for automated healing. After a single Boolean unite, the CAD model is a single body ready for material assignment and meshing. After setting material properties, the default in-house algorithm with specified local mesh size is used. The dense mesh is used to precisely follow geometry at three very close coaxial surfaces. This application notes presents a model of Log-Periodic Dipole Antenna (LPDA) designed in WIPL-D Pro CAD software. LPDA has 52 printed dipoles created from the scratch. The length of the antenna boom is 261.5 mm. The longest arm of the antenna is about 84 mm long, while the length of the shortest arm is about 2 mm. The simulation in wide frequency band is tremendously faster if at each frequency the model is meshed again, and the number of unknowns is adjusted (owing to special feature). The built-in interpolation allows to simulate return loss with minimum number of frequency points. The simulation was done at regular desktop PC, empowered with low-end Nvidia GPU card. The matrix inversion was speeded up by the WIPL-D GPU solver. Design of the Sierpinski antennas is based on the Sierpinski triangle – a well-known planar fractal. The Sierpinski antennas are commonly used in applications where operation at multiple frequencies is required. They can be easily fabricated with conventional printed circuit technology and found in cell phones and various Wi-Fi devices. 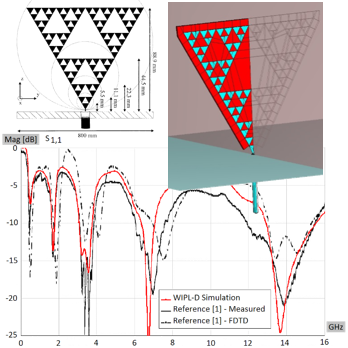 In the WIPL-D simulation, symmetry is applied. The antenna is placed above infinite PEC plane and fed by using 50 Ohms coaxial feeder located below the PEC (the feature is called apertures in PEC/PMC plane). The simulation was done at regular desktop PC in just a couple of seconds per frequency point.The frequency range is from 0.1 GHz to 16 GHz in 60 frequency points (owing to built-in interpolation). The comparison of the measured and simulated return loss confirm excellent accuracy. The model of hyperboloidal lens illuminated by choke horn antenna was successfully designed and simulated using WIPL-D Pro. Process of modelling includes using WIPL-D Pro built in objects, which ensures the optimal required number of unknowns. Such approach makes easier the modelling process and speeds up simulation. The radiation pattern of free space choke horn was compared to the lens antenna, clearly showing the focusing. The effect is also shown by calculating the near field in front and after the lens. All simulations were carried out in several seconds at inexpensive desktop PC. The design of dual-band antenna seems to be irreplaceable part of any GPS system. Most of the modern Global Position System (GPS) receivers operate in L1 frequency band (1575 MHz) with right hand circular polarization. Many applications require more accurate information and use GPS operating in L1 and L2 (1227 MHz) bands. 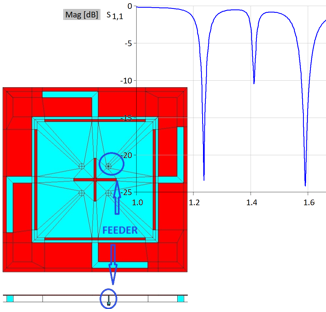 This application note presents WIPL-D Pro simulation of a dual-band antenna intended to operate in GPS. The antenna represents slot loaded microstrip patch antenna with coaxial feed. The result reveals S-parameter which is lower than -20 dB in the L1 and L2 bands. The simulation (with the default numerical kernel settings) is done at rather low number of frequency points, due to built-in interpolation. It was carried out at regular desktop PC, eliminating any need for expensive workstations. The design of a sinuous antenna is often required in wideband airborne and communication applications. 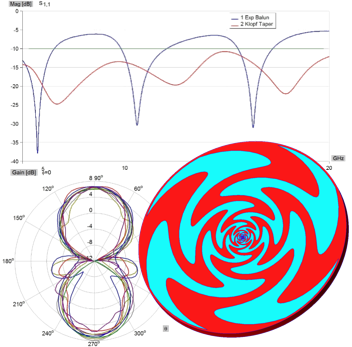 At low frequencies, outer rings resonate, while at high frequencies the inner rings are resonant. At microwave frequencies coaxial cable (unbalanced waveguide) are most commonly used feeders. Here we need balun to transform the input signal from unbalanced to balanced mode. Printed balun (microstrip technology), is placed below the planar sinuous antenna. We analyze two different baluns: Exponential and Klopfenstein taper. They yield return loss under -10 dB in extremely wide frequency band. For the EM simulations, we use a regular desktop computer. The simulation was carried out at only 16 frequency points owing to the efficient built-in interpolation. Simulation time is measured in seconds.